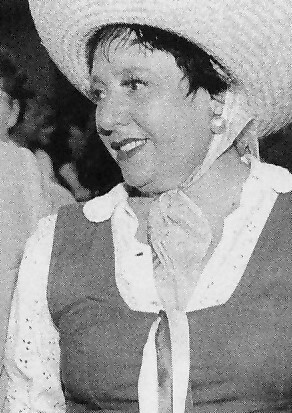 Note: Maria Margelli, one-time secretary to bass Ezio Pinza, was a devoted friend & admirer of Mario Lanza, championing his talent from his earliest days as a young tenor in the early 1940s. Ms. Margelli can be briefly heard speaking at the conclusion of the 1944 "Unknown Aria" recording snippet in our Audio Recordings section here. I feel so ashamed of myself that I can hardly start to write this letter. I wanted to write to you at least ten times before this, but each time I was so sick and depressed with this desert where I am stationed that I just gave up the idea of writing to anyone. I am living in one of the strangest places in the United States because we are at an altitude of five thousand feet, yet in a valley surrounded by much higher mountains. However this valley is not fertile nor beautiful, but simply a huge desert with nothing but cactus plants, dust, snakes, terrific heat and continuous dust storms. So Maria, for the first months I had no voice left. I couldn't even speak and had to get throat treatments at least two times each day. I can stand almost anything but believe me the dust was too much for me to fight against because of my sensitive throat. In fact any singer would have the same trouble out here because we can all understand how sensitive all singers throats are from constant usage. But three weeks ago I met a cowboy who told me what I should do to protect myself against all the dust we inhale. He said “Eat as many raw onions as possible, and never miss a day without them.” I did exactly what he told me to do and Maria: I regained my speaking voice and also have been able to sing arias again. I am now working in the Special Services office here as a singer/actor and also stage director. Of course I haven't sung as yet but I have acted in a few plays in the last few weeks and was also director in the last one we put on. Yesterday my captain made me feel so happy because he told me I would leave this place in about 3 weeks and go to Los Angeles, California. I can fully appreciate a big city like Los Angeles after having lived in the desert for more than 2 months. I know several good singing teachers out there and maybe I can do some work with them. I can hardly wait to get there. Gee, how I miss those happy days back in New York. How well I remember those nights when I used to get on the 7th avenue bus and go right down to the Metropolitan Opera House and see all the operas I love. There are many nights I spend out here just lying on my bed reliving the many beautiful and touching scenes from 'La Boheme'. I sing all the arias to myself and as I do this I am for the time being away from this boring army life and back to grand opera where I really belong. Maria, I would love to have a long letter from you telling me all about things that you have done since I left Florida. I sure am happy to know that you have recovered from your illness. P.S. Another reason for my long delay in writing to you was because I lost your address and had to have my mother send it to me.